I love this pizza pan! We use it all the time for frozen and homemade pizzas. Would 110% recommend! I would suggest to my friends to buy it. This products is great than solid pizza pan because it was easy to wash it and take pizza out of new pans to put on solid pans to cut the pizza to prevent damage from new pizza pans. Great for browning the bottom of anything you use it for. Perforations make the crisper crust. 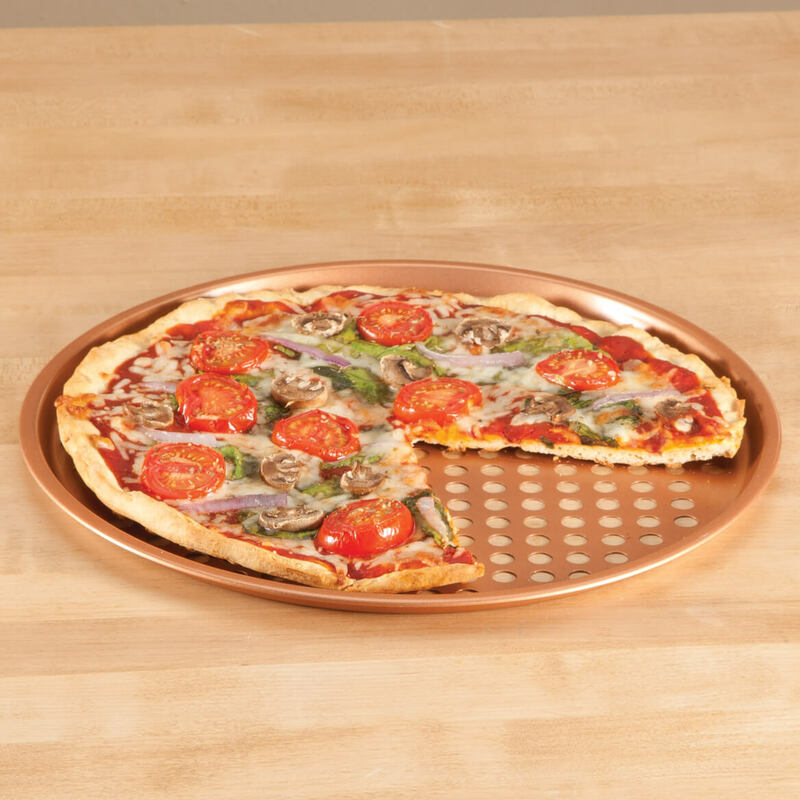 I have several copper pans and i need a pizza pan so i want to try it. love to make own pizza. I like pizza ..... hoping this will brown the bottom better. Love a crispy pizza crust, regular pizza pans just do not give the crispy crust that I am looking for, will to give this a try. Been wanting one and saw this. with the wholes on the bottom it should cook evenly. I HAVE A NEED FOR THE ITEM. What is the pan made from? The description says 1) copper, 2) ceramic and 3) carbon steel. Which is it?? It can’t be all three!! And is the “nonstick” coating material real copper? BEST ANSWER: Thank you for your question. 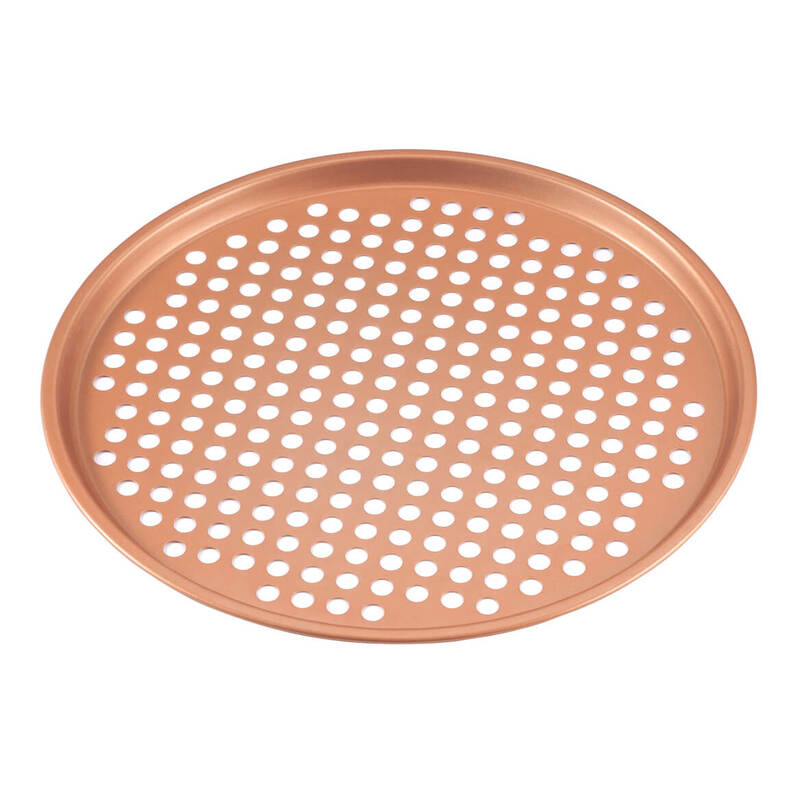 The pan is made of carbon steel with copper coating. We hope this information will be of help to you. can you use on grill? BEST ANSWER: Thank you for your question. No this item cannot be used on a grill. We hope this information will be of help to you.